Do you need tickets for a flight to Rome, Berlin, Milan, Frankfurt, London, Paris, Amsterdam, Vienna, Brussels? Are you a full-time student, age <31, or a free-time youth, age 12-24 years? Thanks to the special student and youth fares of Bulgaria Air and Usit Colours, you can save from the cost of a second luggage for your flight, because you get it for free! Normally, the baggage allowance for most of the flights is 1 and only those who travel for a longer period of time know how impossible it is to pack your whole baggage in this limited space and weight. As a result, often one has to pay an extra-luggage fee, which in most cases costs €50. If you do not need luggage, you can travel with only hand luggage. Thus saving yourself at least €20 from the total cost (the savings could be different depending on the destinations and the period of travel). If later, but before the flight, you decide that you would need a bag, then you can again one up to 23 kg for a fee. By getting a student/youth flight offer from Usit Colours and Bulgaria Air you could buy a round-trip ticket without having to fix the return date in advance. This way you have the freedom to select a date for your return flight when you are absolutely certain of it, but no later than 21 days in advance.This benefit eliminates the probability for you to pay a date change penalty of at least €50 and also guarantees you pay a better price than the cost of 2 one-way tickets. If it is more convenient for you, only for €20 more you could fly to your desired destination in Europe, from Varna or Bourgas, with a fast transfer between the flights at Sofia Airport. Don’t spend hours of travelling to Sofia and back by bus or car, because now flying is cheaper for you. For example, a roundtrip ticket Varna – Rome, via Sofia, would cost only €20 more than a roundtrip ticket Sofia – Rome. * In order to make use of all these benefits and extras to your flight, you need to have a valid student discount card - ISIC or EYCA card. 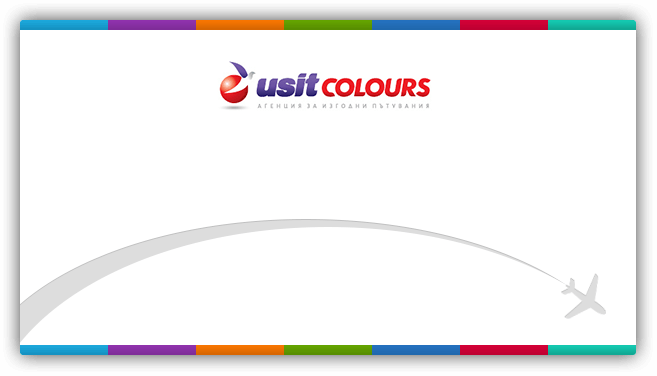 If you don’t possess such a card, you could have it issued in a Usit Colours office or you can order it online. *For some destinations, the seasonality (high-season) rule is valid, so in order to book the return date/new date, additional payment would be needed in order to upgrade to the avaialble tariff and valid price.